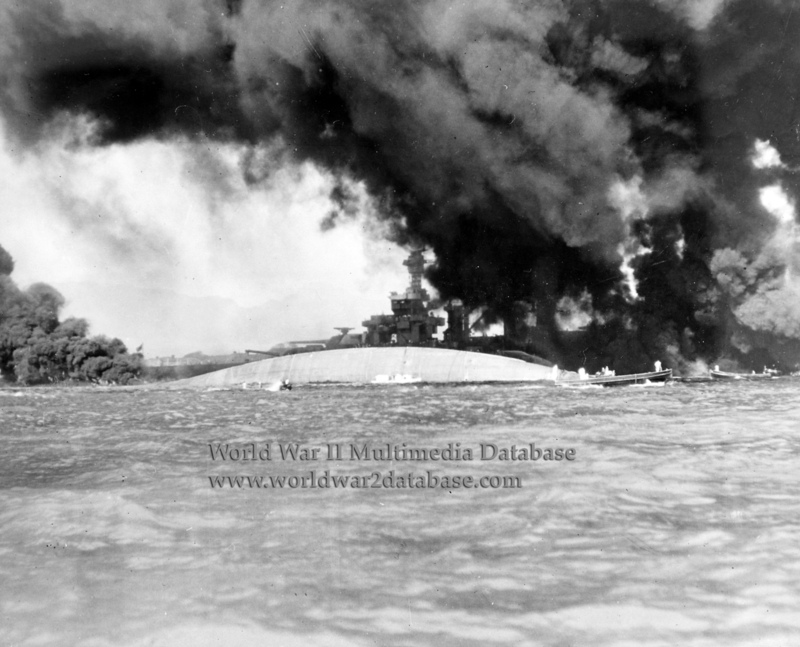 Small boats attend the capsized USS Oklahoma (Bb-37). On December 7, 1941, USS Maryland (BB-46) was moored inboard of Oklahoma, and was thus protected by her when Japanese torpedo planes struck. The unfortunate Oklahoma, an older ship with much less adequate protection against underwater damage, was hit by up to nine torpedoes. Her hull's port side was opened almost completely from below the forward gun turret back to the third turret, a distance of over 250 feet. She listed quickly, her port bilge struck the harbor bottom, and she then rolled almost completely over. Oklahoma came to rest less than twenty minutes after she was first hit. Some of her starboard underwater hull and the starboard propeller were now all that showed above the surface of Pearl Harbor. Some of Oklahoma's men were still alive inside her upturned hull, and their rescue became the focus of an intense effort over the next two days. Thirty-two Sailors were recovered alive, but over four-hundred were killed. In 1943, the capsized ship was rolled upright and raised in one of the salvage profession's greatest undertakings, but she was not further repaired. Oklahoma sank under tow to the mainland for scrapping in 1947. Maryland was hit by two bombs, which caused relatively light damage and some flooding forward. Four of her men lost their lives. The battleship was able to steam to the west coast for final repairs later in December and was fully returned to service in February 1942. Maryland fought at Tarawa, Kwajalein, Saipan, Peleliu, and Leyte as a bombardment platform; and fired at Japanese battleships during the Battle of Surigao Strait in October 1944. That November, she was hit by a kamikaze. At Okinawa in April 1945, she was hit by a another kamikaze but remained on station. After her final overhaul in August 1945, she participated in Operation "Magic Carpet" to bring Americans home. She was decommissioned in April 1947 and scrapped in 1959.